The rules for strengthening time-tables may be relaxed, but I’m not sure if I am… I’m not sure if this the result of a carefully planned out Government policy, or if it is just Nick Smith blowing off steam: the two seem closely related. The way that the media report it, the policy seems to have just arrived out of thin air, but actually, I suspect it is a result of lots and lots of thorough number-crunching by some bods from Stats, and an engineer or two down at Mobie central. This useful, colourful little map will be highly important in the years to come – it nearly relates exactly to the old NZ EQ zones, i think, but seems to have extended a bubble of influence over towards the devastated Christchurch. 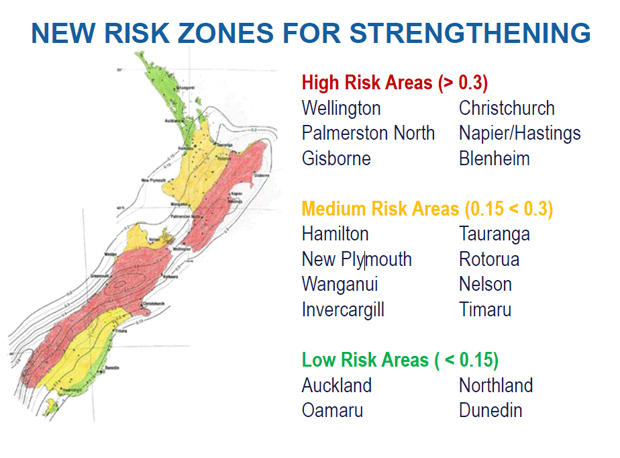 Wellington, Napier, Gisborne, and the whole of the Southern Alps zone, of course, gets branded as the danger zone. 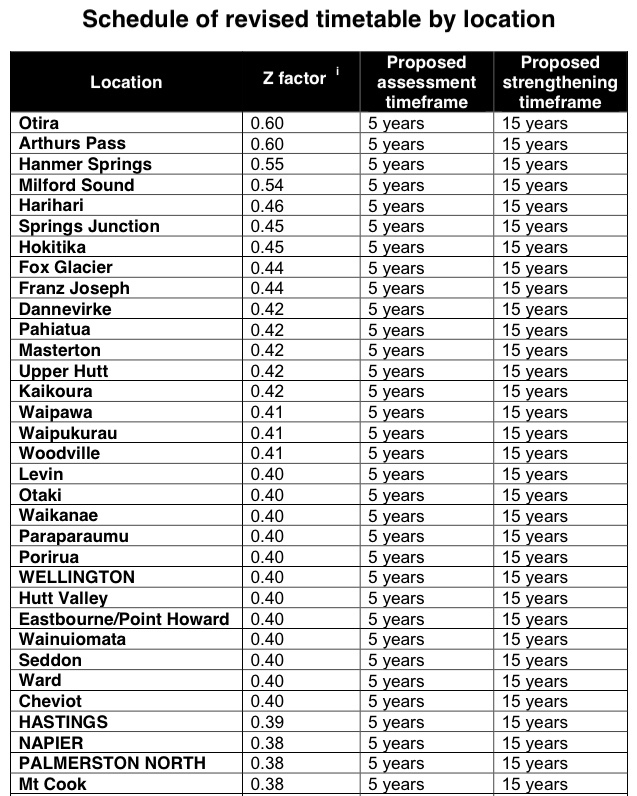 Auckland, Northland, and a thin sliver of the west coast of the South Island gets let off the hook for a few more years. The time table associated with this is long – I’m posting up 3 chunks of info. And then of course, there is the bottom of the table – the places that time forgot – or rather, the places that can smugly put this on the back burner for another quart of a century or more. Time enough for us to figure out how we are going to afford this. According to this article, the changes to the Act also mean that the number of Inspections needed has dropped from 500,000 down to only 30,000. And then of course there is the opposing view, held by Ann Bowers. 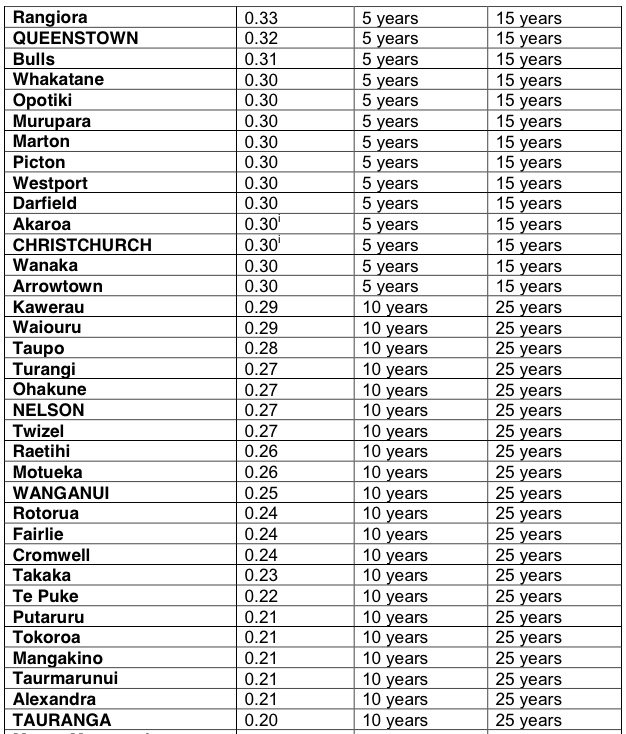 What does this mean in practice for towns and cities like Whanganui? With more time before the deadline, do their commercial tenants renew their leases, or do owners end up with years more of buildings that can’t be tenanted and the strengthening of which can’t be financed? Bigger, architecturally better zombie towns? 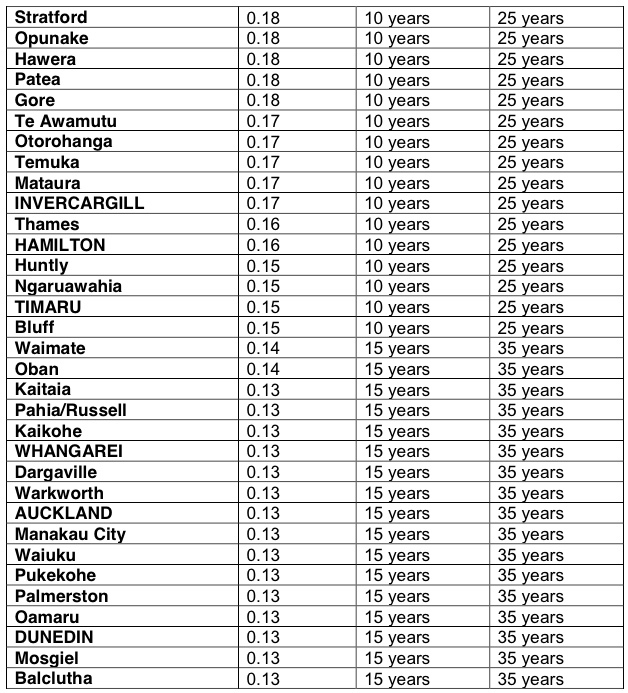 The cynic in me thinks that the real reason the Nats have extended out the deadline is that they know they will be out of power by then, and someone else will have to deal with this mess… but yes, Wanganui has not been thrown a lifeline, so much as perhaps just a slightly longer piece of string… Places like Wanganui, sadly, are doomed, at least architecturally. There’s just not the money in the local economy for anything much in the way of expensive strengthening jobs.